Paperboat Sails: Out of Nowhere and Does My Head Look Big in This? Outside and Inside. That was the difference between Out of Nowhere, by Maria Padian, (Knopf Books for Young Readers, 2013)and Does My Head Look Big in This? (Orchard Books, 2007) by Randa Abdel-Fattah. They are both about the Muslim religion, but in the latter, the main character is actually a girl who follows the faith. The first book is about a high-school senior learning to understand the religion from the outside. I think that Does My Head Look Big in This? was directed toward a younger audience, maybe 6th-8th grade. (I did find it in my middle-school library, after all.) It had many elements that middle-schoolers might relate to, such as crushes, heartbreak, bullies, and body-image. 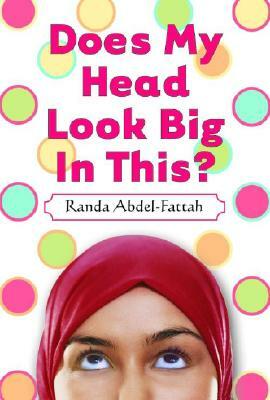 But it also threw in a different dynamic: a young girl, named Amal, decides to wear the hijab. I found it inspiring that she had all her own reasons for doing this: she made the choice. She had to convince her parents to let her, because they were worried about the discrimination she might face. Her principal found it strange that her parents hadn't forced her. Amal felt that wearing the hijab made her closer to God. I'll include an excerpt. "I'm terrified. But at the same time I feel like my passion and conviction in Islam are bursting inside me and I want to prove to myself that I'm strong enough to wear a badge of my faith. I believe it will make me feel so close to God. Because it's pretty hard to walk around with people staring at your "towel-head" and not feel kind of pleased with yourself--if you manage to get through the stares and comments with your head held high. That's when this warm feeling buzzes through you and you smile to yourself, knowing God's watching you, knowing He knows you're trying to be strong to please him. Like you're both i on a private joke and something special and warm and extraordinary is happening and nobody else in the world knows about it because it's your own experience, your own personal friendship with your Creator. I guess when I'm not wearing the hijab I feel like I'm missing out. I feel cheated out of that special bond." I found that her closeness to her religion was so inspiring: the fact that she would go through the "stares and comments" because it made her bond stronger with her God. In the middle of the book, I felt that Abdel-Fattah decided to focus less on the hijab and more on the budding relationship between Amal and her friend Adam. At the end, I felt that the hijab was brought back into the plot line, partly because of a blowout between Adam and Amal. I loved how, when Adam tries to kiss her, Amal pushes him away, because she doesn't want to be with anyone but the person she marries. She wants to share that special feeling with only one person. I found her belief in her religion so amazing, even though the fact that she and Adam were never the same was kind of a letdown, because you're always thinking to yourself, come on.....he has to get the girl! That's how it works! Still, I guess it was refreshing to have a part of a plot line that finally didn't center on that Disney-themed kiss that always morphs into a wedding and then they have little children and smile at each other and kiss again. Overall, this book was very good and I would reccomend it as about 9 out of 10. Now, onto Out of Nowhere. This may be directed more towards a 8th-9th grade audience, as it deals with subjects that might not be appreciated or related to by younger folks. It is a very well-written and thoughtful book. In the following I quote the back of the hardcover edition of the book. "High school senior Tom Bouchard has it all. Popular. Soccer team captain. Third in his class. Hot girlfriend. Then he meets people who have almost nothing. Refugees. Rescued from a homeland turned war zone. In a country that doesn't understand them. And, out of nowhere, everything starts to change." I felt that this book went a bit deeper than the first one, because of how the perspective of Tom Bouchard (the main character) and many others changed when they learned more about the Muslim religion. it's not perfect. They still sometimes don't understand Ramadan, and don't understand the prayers, but they gradually come to terms with whether they should let that get in the way of the friendship with the people who follow this religion. It was amazing to feel the changing emotions of the different characters. In the end, Tom feels bad for one of his Muslim soccer teammate's sister, because that same teammate is missing. He hugs her, forgetting that that is against her religion. She and her family disappear, because Tom's former girlfriend, Cherisse, takes a picture of the hug and posts it on Facebook with a derogatory caption. Their family also disappears because of a rival soccer team's challenge of Saeed's (The aforementioned soccer teammate) eligibility on their high school soccer team. The ending is heartbreaking, yet I couldn't put this book down. I would definitely read it! So. If you were challenged to pick one of these books, I would pick Out of Nowhere, because of the depth and tenderness of it. Does My Head Look Big in This? is a lighter read, but they are both still good. I would even read both of them and see which one you like better! Wow, great job on this. You tackle some pretty serious issues here. Was this an assignment for school or did you do this on your own time? I did it on my own time. Why?